Hello sweet little muffin tins! Sorry, that's one of the nicknames I call my daughters! Today's mani is my first attempt at freehand nail art. It's not awesome but I hope it's not terrible either! It was inspired by a similar version that you may have seen with a bumblebee but I like flutterbys much better! The base of this bit of loveliness is Sinful Colors Cinderella. It's a gorgeous light blue with a pink shimmer that's even better in person! The colors on the butterfly include Wet 'n Wild Black Creme and Sunny Side Up, Pure Ice Free Spirit and Sally Hansen Complete Salon Manicure in Frutti Petutie and Good to Grape. 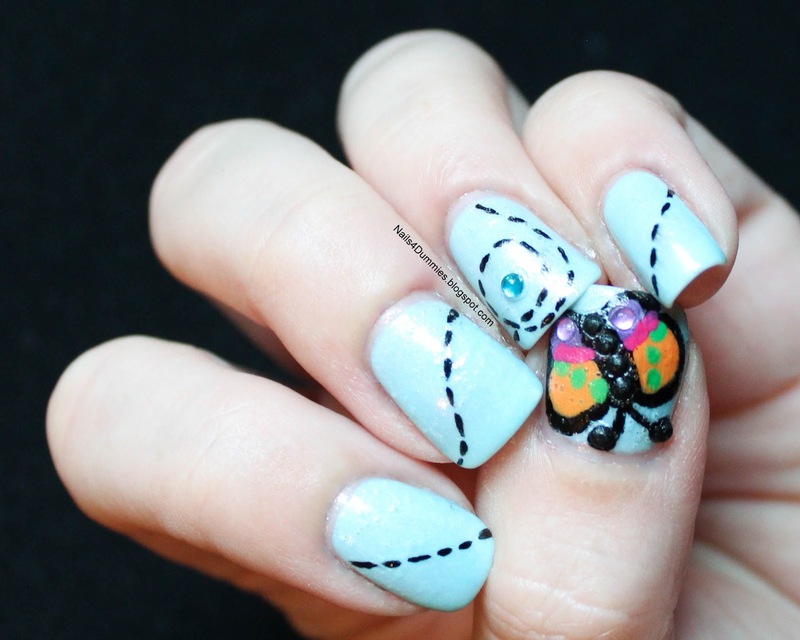 The butterfly was so cute and delicate in my mind's eye but came out more like a giant bug on my finger! I didn't think it was enough of a fail to warrant never trying again though so beware, you'll be seeing more freehand from me! Hopefully I'll improve a little! Ohhh that looks so lovelyyy! I love that sinful color, I've got an obsession! Thanks Jazz!! Yeah, that color called to me from the rack!! Very cute!!! Great job Linds! !